Those of us who watched the Gundam 00 anime to the end saw the movie announcement and the somewhat ominous last screen pointing towards Jupiter hinting of something extraterrestrial, but I’m mildly surprised and amused that Sunrise actually followed through by bringing actual alien lifeforms into the movie. I think it’s the first time any official Gundam anime has had live aliens in broad daylight, so it is somewhat of an occasion. The story basically is that alien life forms appear out of Jupiter and they don’t seem to be friendly. The appearance of aliens falls in line with Aeolia’s plans, and thus Setsuna and Celestial Being are trying to find a solution to the situation while the Earth Federation finds itself under increasing threat by the aliens. In other words, A Wakening of the Trailblazer makes no attempts to be realistic and becomes even more ridiculous as the film goes on. The ending of the movie was the culmination of all the crazy stuff that went on and it’s a bit far out, but after thinking about it I don’t think the movie ending is any worse than what happened in the anime series towards the end. Everyone remembers how Setsuna became the messiah and how twin-drive Trans-Am brought world peace and cured incurable diseases right? A Wakening of the Trailblazer goes off into that general direction, and I thought the ending was somewhat fitting given what happened in the series and also the message that Gundam 00 tries so hard in an over the top way to convey. So the plot of A Wakening of the Trailblazer is a bit preposterous, but there are plenty of other things to like about the film. First of all, the film has better pacing than the Gundam 00 anime series and the story steadily built up towards the final battle without any doldrums in the middle. Another thing I liked is that all of the surviving cast (along with some of the deceased) are back, and despite the large number of characters most of them managed to do something other than just show their faces. In particular, I liked Katy and Patrick who are still the happy couple, and I also liked how Billy finally got over Sumeragi and has a hot colleague (appearing to be a nicer version of Nena Trinity) falling all over him. I am a bit disappointed in Setsuna though, mostly because he wasn’t too impressive in the fights, but he is still expressionless savior of the world. Speaking of the fights, the action is undoubtedly the strongest aspect of the movie and Sunrise didn’t spare any expense animating the space battles. The battles were fast-paced and chaotic, and sometimes it was even borderline overwhelming just with the sheer amount of stuff that was shooting and getting blown up on screen at the same time. It’s dazzling and dizzying at the same time, and I loved it. The new mobile weapons also looked good, although there wasn’t much in the way of brand new abilities. Overall, I enjoyed watching A Wakening of the Trailblazer. Sure, the plot didn’t make much sense, but I wasn’t expecting much given what happened in the Gundam 00 series. I mainly wanted to see Gundams and a lot of stuff being blasted into bits in spectacular fashion, and A Wakening of the Trailblazer delivers those in spades. It certainly wasn’t boring and had a lot of action, and to me that’s a pretty decent movie. The in-universe movie that Saji was watching about the battle between Celestial Being and A-LAWS was pretty hilarious. They actually got Setsuna’s look right but got the other three Gundam Meisters all wrong. It was like Power Rangers with Gundams, and the funniest thing was that the actual final battle (or the second to last episode of the series) was even more over-the-top than the in-universe movie. The random grey-haired Innovator pilot with the giant mobile armor was kind of pointless, but he blew up a lot of stuff so I can’t complain too much. 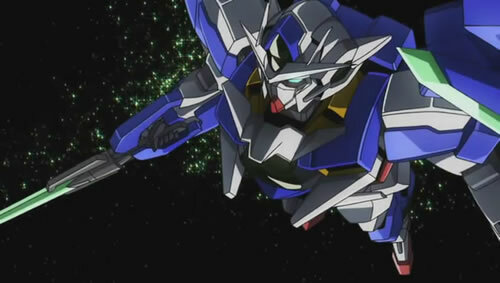 Now that we’ve had the Gundam 00 movie, where is that Gundam SEED movie you promised us, Sunrise?